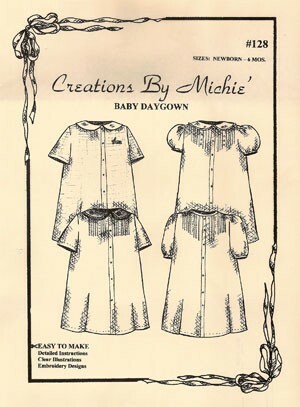 Baby Daygown may be left plain or finished w/tiny tucks& delicate embroidery on the front. The neck opening may be finished w/a Peter Pan collar w/piping, faggoting, lace or a simple band. A choice of 2 tuck guides& embroidery designs are included.